For decades we were told that flat TV screens, those darlings of science fiction writers past and present were just around the corner. When they finally arrived, the technologies quickly multiplied. First there was Liquid Crystal Display technology (LCD) then there was plasma, then Surface-conduction Electron-emitter (SED). Now these three are about to be joined by a fourth flat screen technology, one that has the potential of being the roll-up, wallpaper screen of fiction. It's called OLED or Organic Light Emitting Diode technology and it promises to revolutionize almost everything that uses displays from cell phones, PDAs and keyboards, to computer monitors and HDTVs. The first OLEDs were developed by Kodak in the late 1980s and since then, companies such as Samsung and Sony have been working to perfect both the technology itself and its manufacturability. This work is now beginning to bear fruit and products using this technology are right around the corner. The earliest solid-state light-producing device to hit the market was the Light-Emitting Diode, or LED. This semiconductor device was found to emit a bright light when current was passed through it. Being solid-state, it lacked a filament to burn-out and so it was seen to be a very reliable, long lasting light source. Soon all manner of displays appeared using this technology, most of which were alpha-numeric. They showed up on our wrist-watches, our radio dials, and even our automobile dashboards. In the middle 1970s, Sony started using LEDs in very large screen TV monitors for stadiums, auditoriums and concert halls, but they were never able to make an LED-based video display that was practical for home use because of the size and power requirements of the then current LED technology. It took a passive system, the LCD, to make the breakthrough to home and office electronics. LCD is a very low-power technology and the individual pixel size is a function of manufacturing processes so it lends itself to a myriad of tasks and screen resolutions. Unfortunately, LCD is non-emissive, that is to say that it doesn't produce any light in and of itself, but merely controls the amount of light that actually reaches our eyes from a supplied light source located behind the screen. The need for a flat, uniformly bright back-light over the entire screen area has made the low-power characteristics of the LCD somewhat moot. The backlight accounts for most of the power budget in these displays. That's why your digital camera batteries go flat so quickly when you use the LCD viewfinder. What is needed is an emissive technology that has low power consumption and that can be made with manufacturing techniques akin to those producing LCD screens. In other words, instead of individual LED devices, this technology needs to be producible as a continuous film containing all three primary additive colors (Red, Green, Blue) in a matrix containing as many pixels as are needed for the application in question. OLED meets these requirements by placing a series of organic thin films between two transparent electrodes. An electric current causes these films to produce a bright light. By using semiconductor technology, each pixel can be addressed individually thus controlling the patterns of light and color which combine to form a picture. The organic process used in OLED is called electrophosphorescence and is a biological phenomenon that has been noted and wondered at for eons. Fireflies, plankton, and many sea creatures all possess this characteristic naturally. But it's only in the last few years that researchers have been able to synthesize it non-biologically. Even though these OLED panels are made up of several layers of doped fluorocarbon polymers, the result is a system which is very thin, usually less than 0.5 thousandths of a millimeter thick. These OLEDs produce self-luminous displays that do not require backlighting and can operate at very low current with only 2-10 volts. These thin displays can be made flexible, and have a wide viewing angle of up to 170 degrees. Just like liquid crystal and plasma, OLED can be made as either a passive or an active matrix. A passive matrix would be one where rows and columns of pixels are selected, i.e. energizing row 6 and column 5 would mean that only the pixel at that intersection, 6 rows down and 5 columns over would light. This particular operating mode is ideal for small, cheap displays such as smart-cards and watches. The second method, the active matrix mode is one in which each LED element is brought out separately to the edge of the display and is driven by its own transistor using TFT (Thin-Film-Transistor) technology. In this case each LED can be turned on or off without regard to what's happening on the rest of the display. This mode produces faster response times and allows for more control over brightness levels and contrast. 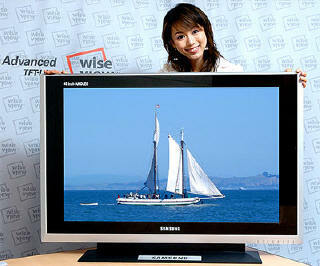 OLEDs possess several advantages that make them ideal for HDTV. They are brighter than any back-lit passive technology and they react faster to changes in signal than do either plasma or LCD TVs making them much better suited for full-motion video. They also are much lighter in weight, and are more durable. Using a flexible substrate, these devices would be almost impervious to shock or torsional forces. They also enjoy a much greater operating temperature range, making them ideal for hostile environments. No backlight means lower power consumption and one less component to fail or wear out. We have already seen that OLED offers displays which are thinner than current LCD or plasma HDTVs, and because the polymer films which make up the OLED are very flexible as well as thin, they don't need a rigid substrate as do these other technologies. This means that OLED screens could be rolled-up like a newspaper. OLEDs are also brighter than LCD because they are emissive devices not merely transmissive. LCD has to pass light produced by a backlight and in so doing, it naturally absorbs and attenuates some of it. Also because OLEDs do not function by blocking light but rather by producing it, they don't have the problems with off-axis viewing that LCD possesses. Another advantage to OLED is that once production ramps up, displays will be much easier to produce and can be made in much larger sizes. Because OLEDs are essentially plastics, they can be made into large thin sheets much more easily than one can grow and lay down liquid crystal elements or arrange thousands of tri-colored plasma cells onto a glass substrate. While OLED seems to be, on the surface, the perfect display technology, there are some problems. First of all, even though the red and green LEDs have long lifetimes of 10,000 to 40,000 hours, the blue component suffers high failure rates after about 3,000 - 5,000 hours. It is believed at this time that with refinements in manufacturing technology, this limitation can be overcome fairly quickly, but as it stands now, the entire screen's life is limited by the blue LEDs' life. Also, as of this writing, manufacturing processes are expensive. But like everything else, cost is a direct result of yield. As experience is gained manufacturing these devices, the cost will come down just as it did with LCD. Finally, the OLED matrix is easily damaged by water. Without some way to seal the display in a waterproof outer covering, a spilled soft drink could spell curtains for the display. This unit is not yet for sale. Large screen HDTVs as thin as wallpaper are a very appealing prospect and may well be the first large-scale use of OLEDs. Although Samsung has announced the first 40" OLED TV based on this technology, it is still unclear when OLED technology will be in mass production and when it will become price competitive with existing technologies. If it can fulfill its promise, a wide variety of applications will benefit.